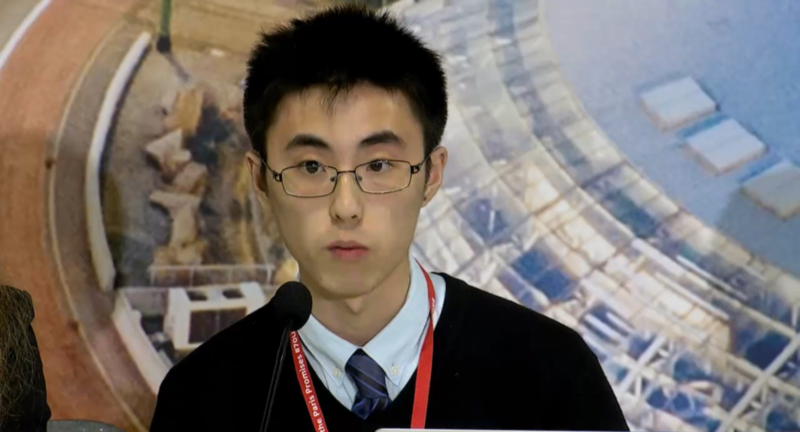 February 1, 2019 – This past December, mechanical engineering student Zhenglin Liu (Year 4 MIE) delivered a speech to a room full of world leaders and activists at the Conference of the Parties (COP), a major international meeting on climate change hosted by the United Nations in Katowice, Poland. A few days later, he spoke at a press conference for YOUNGO, the youth constituency of the United Nations Framework Convention on Climate Change. At the two week-long conference, Zhenglin worked with youth delegates from around the world on negotiations concerning transparency, the impacts of response measures, aviation and maritime transport. Zhenglin, who is currently doing his Professional Experience Year, chose to specialize in the Energy and Environment stream at the University of Toronto’s Department of Mechanical & Industrial Engineering (MIE). He says he learned a lot from discussions about environmental implications in several MIE courses including MIE 313 Heat Transfer with Professor Aimy Bazylak and MIE 311 Thermal Energy Conversion with Professor James Wallace. It was at an Engineers Without Borders event a few years ago that Zhenglin first considered the possibility of attending the climate change conference. Fellow student Sam Harrison (EngSci 1T8 + PEY) spoke about his experience attending COP in 2016. Zhenglin approached Professor Matthew Hoffmann, who teaches political science at U of T and is co-director of the Environmental Governance Lab, about the possibility of attending COP. With the help of Sam and Professor Hoffmann, Zhenglin was able to register to attend as a civil society observer under accreditation from U of T.
“My main goal at COP,” says Zhenglin,”was to learn more about international climate policymaking, both what these negotiations look like in action and how different sectors can contribute to an environmentally and morally responsible outcome.” Zhenglin also wanted to build stronger connections between the Canadian climate NGO community and the U of T Environmental Action (UTEA) student group, of which he is an External Advocacy Director. After coming home from the whirlwind convention, Zhenglin says he sees the importance of such large-scale meetings to hold governments accountable, but that changes at the national, provincial, local and individual levels are critical. He thinks engineers can make a difference by creating sustainable options such as fabrication processes that require less energy and material or building systems that are more resilient to climate change impacts and extreme weather.